Launchpad couldn't import bug #44777 from freedesktop.org Bugzilla. Since a karmic update last week, when pulseaudio is running it floods the network with multicast packets, to the point where the wireless interface I'm using is so flooded that no other network traffic can be transfered. As can be seen, these packets are sent several hundreds times a second and this completely overloads the network interface. Apparently I have pulseaudio set with network access enabled, but I can't disable it as the pulseaudio configuration is completely disabled (see screenshot). As pulseaudio keeps recovering itself the only way I can get any work done at the moment is to run "while true; do killall pulseaudio; sleep 1; done" whenever I want to do anything on the network. The multicast/RTP configuration is also disabled (see screenshot) - The only configuration accessible is the simultaneous output. Aug 11 01:26:28 sepiroth pulseaudio: module-rtp-recv.c: Detected RTP packet loop! See attached file with pulseaudio log debug mode running for a couple of minutes. It starts flooding the network immediately as it goes up, it then later started with the alsa-sink rewind stuff, which I'm pretty sure is not related. If I use padevchooser to specifically choose the internal audio as both default sink and default source, the network traffic is reduces somewhat but not by a lot (about 10%~20%). I can cause pulseaudio to stop flooding the network completely by disabling the rtp-send module using gconf. I'll keep it disabled for now (as I do not have a real need at the moment for audio over the network) unless you want me to debug something. Could you possibly explain why is this "Low" importance? The bug means that anyone running Pulseaudio (which is everyone, correct?) is essentially committing a denial-of-service attack on all machines on their network (unless this only applies to certain configurations). Surely this is at the very least a "Major" bug? I just upgraded to Karmic on my test system and hit the exact same problem. > Could you possibly explain why is this "Low" importance? > The bug means that anyone running Pulseaudio (which is everyone, correct?) is essentially committing a denial-of-service attack on all machines on their network (unless this only applies to certain configurations). Surely this is at the very least a "Major" bug? without proper ulimits set would be. Fascinating. I did an "apt-get install padevchooser" which was not installed after the system updated to Karmic and that seemed to turn rtp-send off and the system started behaving. That install pulled in paprefs and zeroconf support. On reboot it started spewing again, and going into paprefs, rtp-send was enabled. However, paprefs allowed me to disable it and on rebooting after doing so, it is still disabled. Any attempt to enable it causes the looping behaviour. It seems to be taking its own broadcasts and responding to them. I've installed the Natty Beta and am experiencing the same thing. Multicast/RTP is unchecked in Pulseaudio prefs, however, it's still spewing. I have an Airport Express on my network as an audio gateway. All the packets are targeted at it. 185 KIB/s. My issue survived the upgrade to Natty Beta 2. I think I just saw this issue also. I was seeing a lot of traffic over my wireless NIC going directly to one of three Apple AirTunes devices on my work network (the one I had connected to previously). Even though I set "Internal Audio Analog Stereo" under Sound Preferences/Output tab - so the AirPort was not selected, PulseAudio still was going nuts with traffic to it. Before I had a chance to look into it further, another sysadmin had password-protected the device (apparently others were complaining that they could no longer connect to it to play music and rebooting the AirPort multiple times wasn't helping) and I could immediately see the outgoing traffic on the laptop stopped. I was so excited that I could finally play audio to these horrible proprietary devices (purchasing them wasn't my decision), but now it's password-protected I'm not sure PulseAudio can play to the device any more - even though I know what the device password is. I should point out that the laptop in question was actually running Debian testing, so this likely needs to be dealt with upstream by the PA guys. Experiencing this problem with Ubuntu 10.10 and pulseaudio "0.9.21-63-gd3efa-dirty" (no AirTunes connected, enabled or in any way connected to the network). - Network gets flooded with multicast packets. - Enabled Multicast/RTP sender with seperate audio device for PulseAudio Multicast/RTP. - No other network settings enabled. to /etc/pulse/default.pa, pulseaudio starts flooding the packet with more than 100 UDP packets per second. My router can't handle that and fails to serve any other devices. The network is practially DOS'd by pulseaudio. Same issue. Using rtp-send causes flooding of my whole local network. Computer using pulseaudio is connected via LAN on a router. I am using Ubuntu 12.04 / 64bit. Other computers are connected via WLAN and they loose connection. Sometimes router crashes. Flooding has a bandwidth of 180 KByte/s. I have seen in google that this problem is existing since at least 2008 !!!!! Why the guys report bugs but noone is caring?? Same thing here, rtp module is an insteresting feature but is just unusable. An update anyone on this problem ? No updates. I'm not aware of anyone working on this. it's alive and well. i'm here on my second day of searching. network sends jump to 90+kb/s whenever i play audio, regardless of location, source, and player. have no idea how i tripped this "feature", but will attempt above "fix". 10.04 running on hp touchsmart, which is neither touch nor smart. Subscribing in hope of fix. I would like to say that this problem is still there and is the reason why I am not able to stream audio using RTP. IT will flood my entire network! Is there a fix already? I am running Ubuntu 12.10 64bit. I have this problem too. My network becomes completely unusable. I also observe a constant bandwidth of a bit less than 200KB/s. This fits the expected PCM data rate (176KB/s). But this shouldn't congest the network. And indeed the same bandwidth caused by module-tunnel-sink works completely fine. Are our routers at fault or is something fishy with module-rtp-send? Confirming what appears to be this bug on 12.10. Noticed constant network usage of 150-200 Kb/sec outgoing, which was causing substantial slowing over wifi interface. Checked aroung and there were multiple connections spawned by pulseaudio. Disabling network devices using paprefs completely eliminated pulseaudio generated connections and stopped the passive network utilization. EDIT: Appears to be limited to Apple Airfoil/AirTunes compatibility plugin thingie. Disabled just "make discoverable Apple AirTunes devices available locally" and that cut the bandwidth. Normal PulseAudio network devices did not seem to experience the same bug. 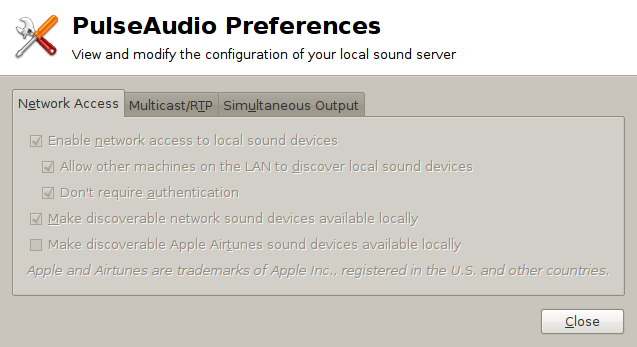 EDIT: Checked Multicast/RTP: it appears the aforementioned plugin for Apple AirTunes forces the Multicast/RTP settings. Enabling Multicast/RTP independently of Apple AirTunes support yields same results. My apologies for the numerous comments. Just confirming that I'm seeing that kind of behavior on Fedora 19 too (so not ubuntu-specific), enabling the Multicast/RTP sender will cause constant UDP upload activity towards 224.0.0.56, in my case at ~180 KB/s. I think this explains my other computer (laptop) having trouble associating to the wifi, even though this desktop computer is connected through a wired connection. My router is basically new hardware (Netgear WNR3500L/U/v2) running the Tomato firmware, and I really doubt that anything is at fault on that side. 1) I presume module-rtp-send shouldn't be sending a constant stream of zero-filled packets just by being loaded with no sources assigned to the sink. That seems really inefficient, especially if sound output is infrequent and/or you have a network with many computers and want to be able to support n-to-n source/sink setups (n number of constant all-zero multicast streams...). It appears that even running multicast on a wired network where wifi access points are connected can cause a takedown of the wifi networks if the wifi access points aren't filtering multicast. b) there are some proposals for fixing this in a later revision of 802.11 but nothing we can use for a long time. and the LMS implementation is said to have excellent synchronization which looks to be handled fairly simply in the perl code. A PA sender and receiver that implemented a subset of squeeze might be neat to have - might even be usable with some of the hardware players. Note: LMS (perl) is GPLv2 but slimsqueeze (c) is GPLv3 so direct code-reuse into PA is probably not possible. I just encountered this same symptoms today in my newly upgraded ubuntu (from LTS 12.04 to LTS 14.04): 100-150kB upload to 224.0.0.56 and my wifi down to less than 1Mb effective bandwidth. There were a few updates today which seem to have triggered the behaviour, as I had no problems before the update. But I cant seem to find the update history so I can't tell you which packages - it included a kernel update & reboot. I'm now running 3.13.0-24-generic. Disabling rtp-send as per #5 works around the problem - and I'm not planning on streaming any audio any time soon. I just stumbled upon this problem on an upgrade from 14.10 to 15.04 and this is absolutely killing everything on my network, completely crazy. Using paprefs and disabling the RTP sender did the trick though. The same here on two boxes. When I enable rtp sender even if I don't send any stream to RTP Sender sinc my Wi-Fi connection is getting flooded. 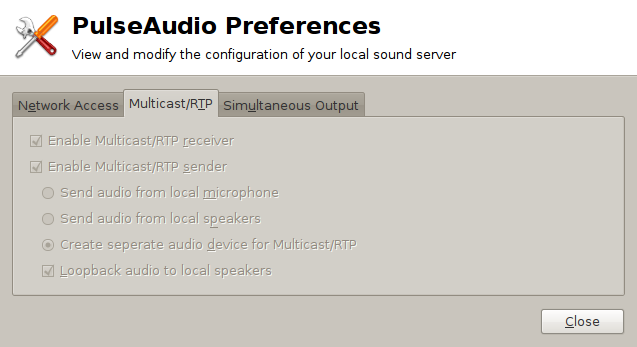 I launched "Pulseaudio preferences" ---> under the tab "multicast/RTP", disabled "Multicast/RTP sender" . @Solaris That's not a fix, that's just disabling the feature. This problem still exists. I'm on Ubuntu 15.10 and RTP send is flooding my network resulting in near total DoS. 3 installs later just to find it creep into my system after a couple of days, and nothing on the web unless you know the phrase "flooded" the network. indeed no Airtunes here, perhaps it started after installing Audacity - I don't know for sure, but kinda makes sense know. indeed paprefs - Multicast/RTP - DISable "Multicast/RTP sender"
My machine was sending ~ 180KB/s to 224.0.0.56 until I unchecked "Enable Multicast/RTP sender" in paprefs. Confirming this bug too. I falsely blamed the provider for an unusable internet connection until I found out that it was my pulseaudio RTP module. BLUSH. Well I wanted to be sending via RTP so disabling the module is just a temporary measure which makes me use Internet again LOL. But it surely is a bug. I am on Ubuntu 14.04.5 platform. I came across the same bug yesterday while trying to set up pulseaudio server on Windows to send audio from my Ubuntu laptop in local network and it rendered the home network unusable. It costed me hours to locate the pest. Dos attack triggered by pavucontrol, when I close it flooding diminishes. Nobody's patched it for 8 years, so we have to live with this bug and no RTP server until my learning curve reaches a higher level to overcome it. I noticed the same bug in my system ( Ubuntu 14.04.5) while I was trying to set up pulseaudio server in Windows 10 over the local network. In my case network flooding occurs whenever I launch pavucontrol, upload traffics reaches up to 200kb/s and it reduced the local network unusable. When I close it the network attack diminishes. I added `unload-module module-rtp-send` into `/etc/pulse/default.pa` to workaround the bug. I've also noticed this in the most up to data pulse versions from archlinux. I also cannot use a ttl of 1, as the router does not decrease the value when routing into wlan, as it has the same subnet. Neither does destination ip 24.0.0.1 help. From my side I have no chance to change the router config, because the internet is provided by someone else. I could also add a menu in paprefs that'd also adress the ip directly, however this is more of a struggle because of the old gtk2 (if anyone here is following the mailing list). It would be highly appreciated to fix this bug in the module itself and reduce the payload somehow. I read through the comments, and to me it looks like module-rtp-send doesn't have any flooding bug. The data rate of PCM audio is what it is, and the network hardware isn't always able to handle it. Multicast RTP is not enabled by default. If the user enables it, I don't know what we could possibly do to not "flood" the network. Since this is a common problem for people, there is certainly room for improvement in the UI and documentation so that users don't get so surprised when things don't work. Adding to my previous comment: it could be argued that the bug is that we transmit PCM audio instead of compressed audio. Adding support for compressed audio should help with the network stress. Does anyone volunteer to implement this? 1) Transferring a WAV file over the network goes faster than real time (in terms of the audio contained within). Why should the network struggle with uncompressed RTP audio, then? 2) Why are packets generated when nothing is played? If there is no audio activity in PA, there is no need to send any packets. Apologies if this doesn't make sense, I'm talking purely as an end-user. Sending a wav file means a TCP connection between two computers. TCP connections are the most common type of traffic, and the hardware is optimized accordingly. UDP multicast is different, and apparently network hardware is not necessarily as efficient with processing that protocol. Comment #9 seems to suggest that the wifi specification itself forces multicast to be inefficient, so it's not necessarily just the hardware's fault. Starting from PA version 5.0, module-rtp-send should not generate traffic when nothing is playing (it can still be configured to play silence, but paprefs doesn't configure the module that way). If you observe different behaviour, please file a new bug and attach the output of "pactl list". You are right that this feature needs to be enabled first to make the bug rise. However I do not think that documentating this bug/behavior solves the problem. I do want to use music streaming, but I cannot do this as my router routes the traffic into the WLAN. Lowering the rate is possibly not a good idea as it results in worse quality. The format is by default "s16be" about which I have no idea what a different format would help. I do not know if the data can somehow be compress further, because this would definitely be an idea, but I dont know the procols internal. So the only left option is to solve the routing. For my personal setup there is no way to fix this on the router side, so the sender pulse module needs to take care of it. Using an ip as destination works perfectly and would be an option to use (which should be added to paprefs). However I tried that the last days and due to dhcp my receiver always gets a new IP and using hostnames would be a better idea. But the module does not seem to support hostnames. So I am wondering if this could be fixed quite simple or needs a whole more work to do. Another option would be to possibly create a port on the localhost and route that to the destination ip/name. And the kernel itself can do the name resolution. However I have no idea about that, but this could at least be a workaround to solve this issue. The data can certainly be compressed. I don't know if you've ever compared the sizes of mp3 and wav files. Typical compressed audio, when using a lossy codec, requires perhaps one tenth of the bandwidth that uncompressed audio requires, without too much effect on the audio quality. > hostnames would be a better idea. > could be fixed quite simple or needs a whole more work to do. Changing module-rtp-send to support hostnames doesn't sound terribly complicated. Sure mp3 would be way better. I just dont know how rtp works. I think its reasonable to use mp3 here. However I dont know how that works for streams and with pulse. Fixing the compression method would be the better fix, however a specific ip/hostname would not hurt neither. To my knowledge RTP can carry pretty much any format. You said on the mailing list that you want to use Kodi to receive the stream, and I don't know what Kodi supports, but I would guess that it supports many formats. Don't get too excited about compressed audio, though. I'm not volunteering to implement it, and it's probably pretty complicated to integrate to PulseAudio. In case someone is willing to take this task, the current "plan" (if you can call it a plan - it's all very fuzzy at the moment) is to use gstreamer to deal with the codecs, but in any case, please bring this topic up on the mailing list before spending too much time implementing it, so that there's an agreement about the design. This are upstream bug with Flooding packages to Network. On pulseaudio 9.0 same problem, but upstream reqired to fix it up. All problems with RTP module flooding network, Wifi are caused by lack of IGMP support in rtp_send module. root@orangepione:~# tshark -i eth0 -Y "igmp"
Pulseaudio creates Multicast group (I don't use default group). As IGMP signalling is OK - IGMP capable switches enable that multicast group only on ports that need it. If pulseaudio is configured with rtp_send module - there is no IGMP signalling. IP_ADD_MEMBERSHIP tells kernel to join multicast group. followed by killall pulseaudio again did and this will doubtless work until the package is updated. I have no idea why this issue popped up today. I haven't made any changes to my sound settings for a while and the timestamp on ~/.gconf/system/pulseaudio/modules/rtp-send is July 2012. You can subscribe and participate further through the new bug through this link to our GitLab instance: https://gitlab.freedesktop.org/pulseaudio/pulseaudio/issues/505. This ticket was opened 9 years ago. Bug still exists in Ubuntu 16.04.05. This feature still floods the network with packets. Disabling it isn't a fix, its merely opting out of a broken feature. Closed for Ubuntu since the bug is closed upstream. If you feel this is incorrect then please comment upstream (https://gitlab.freedesktop.org/pulseaudio/pulseaudio/issues/505) and then here.